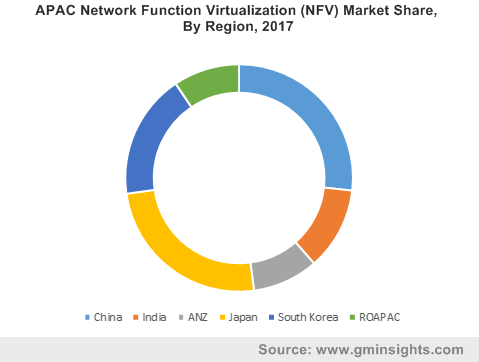 NFV Market size was estimated at over USD 5 billion in 2017, growing at a CAGR of over 42% from 2018 to 2024. The NFV market is projected to exhibit an accelerated growth between 2018 and 2024 due to the growing demand for data center virtualization and server consolidation among enterprise customers and the benefits of reduced CAPEX and OPEX for enterprises through the virtualization of networking functions. Enterprises can significantly reduce their investment in procuring hardware and networking components by virtualizing their essential network functions on dedicated hardware. This offers unprecedented agility and optimized network scalability to the enterprises. NFV also offers opportunities for the trial and deployment of innovative services at lower risks. Due to lower hardware infrastructure costs, new service models can be effectively tested and commercialized in the network function virtualization market in a relatively lesser time. NFV also enables reduced energy consumption by leveraging the power management capabilities in modern servers and storage devices. These capabilities are majorly contributing to the rapid adoption of this technology across distinct industry verticals such as IT & Telecom, manufacturing, retail, BFSI, and the government sector. The service segment in NFV market is projected to register the fastest growth between 2018 and 2024 with a CAGR of over 52% due to the large-scale adoption of managed services for effectively managing virtualized network infrastructures. Deploying and managing virtualized network architecture requires a high level of technical expertise. Updated skills are a critical element for enterprises in the move toward NFV. Organizations, in the short term, are relying on vendors, managed service providers, and consultancies to address the skill-gap required for the successful implementation of the NFV infrastructure. Virtualization requires a multi-disciplinary, horizontal approach where different teams (network, application, security) must collaborate to achieve the strategic objectives. Consequently, the uptake of training & consulting services as well as managed services for ensuring successful deployment and optimum performance of virtual network functions is likely to accelerate consistently over the forecast timeline. The IT & Telecom application held a major network function virtualization (NFV) market share of over 32% in 2017 and is projected to maintain a dominant share throughout the forecast period due to the massive uptake of NFV solutions in the telecom sector. Telecom service providers are deploying NFV solutions rapidly in their networks to benefit from the business advantages of improved programmability, faster service enablement and lower CAPEX/OPEX offered by the technology. NFV allows them to quickly react to the changing market conditions. To achieve a faster time to market and service agility, the operators use NFV in conjunction with advanced technologies such as IoT, Wi-Fi calling, and VoLTE. Some of the key trends influencing the growing adoption of NFV solutions in the telecom sector include the growing interest among operators to build their own solutions, increasing number of partnerships among telecom operators, open source communities, and the rising trend among the operators to develop specialized solutions in collaboration with their suppliers. North America held a majority market share of over 40% in the global NFV market in 2017 and is estimated to dominate the overall market throughout the forecast period. The extensive presence of leading global telecom service providers and cloud service providers, a massive investment in the data center and cloud ecosystem, and the large-scale implementation of industrial IoT (IIoT) in various industrial sectors in the U.S. are some of the key factors contributing to the increasing demand for NFV solutions. Moreover, the telecom service providers in the U.S. are investing heavily in 5G technology implementation to offer excellent network connectivity to their customers. For instance, in April 2018, two of the leading wireless carriers in the U.S., T-Mobile, and Sprint announced a USD 26 billion all-stock mergers. The combined company is slated to invest nearly USD 40 billion over the next three years to modernize their network infrastructure to accommodate 5G. Such investments in the network technology will majorly contribute to the growing necessity of modern networking technologies such as NFV in the region over the next five to seven years. 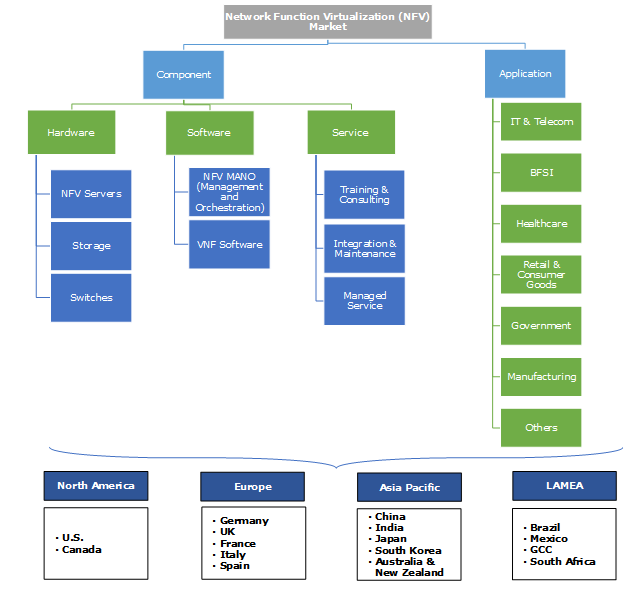 The competition in the NFV market is characterized by large-scale investments in R&D for developing advanced NFV frameworks, collaborations & partnerships among telecom service providers and cloud service providers to offer cloud-native NFV solutions to their customers, and the growing investments in the commercialization of 5G network technology. In February 2018, VMware and Tech Mahindra, the major providers of digital transformation and business re-engineering solutions & services, entered into a strategic collaboration. The partnership was intended toward delivering sophisticated solutions to global Communication Service Providers (CSPs) to accelerate their network transformation by combining VMware’s NFV platform with Tech Mahindra’s network services. In December 2016, Cisco, Ericsson, Nokia and Huawei signed a Memorandum of Understanding (MOU) for creating the NFV Interoperability Testing Initiative (NFV-ITI). The objective behind the formation of NFV-ITI was to encourage competition and to develop a common framework for NFV interoperability testing. Such initiatives are facilitating the large-scale deployment and advancements in the NFV technology. Some of the key players operating in the network function virtualization market are Huawei, Ericsson, Cisco, Juniper, VMware, Nokia, F5 Networks, HP, AT&T, Citrix, NFWare, Riverbed, 6Wind, Broadcom, Verizon, Pluribus, Arista, Amdocs, and IBM. The rapid shift toward network and application virtualization by service providers and operators requires next-generation multi-core processors and other specialized hardware appliances. The vendors are focusing on developing such advanced hardware components for modern networking architectures. The demand for industry standard high-volume servers is expected to increase significantly over the forecast period to support intensive network virtualization functions in the enterprise environment. As the industry is moving toward generic hardware that can be utilized across different networking applications, NFV provides the highest degree of flexibility by deploying x86 servers with general purpose processors.